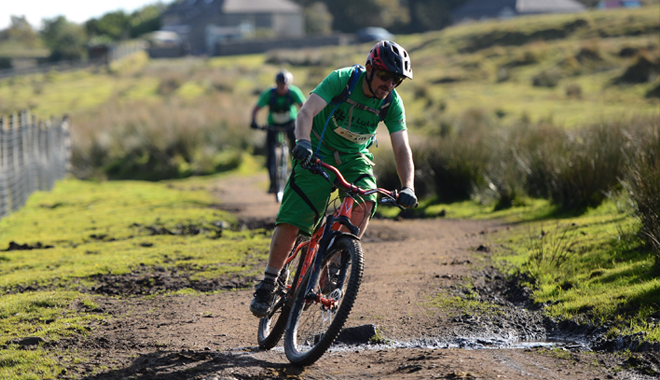 St Luke’s Hospice Plymouth are inviting the toughest of cyclists to master the moors on Sunday 15 October and take on their annual Tour de Moor challenge. There will be mud, sweat and plenty of gears in action as mountain bike riders take to the moors to embark on a cycle ride like no other. Sponsored by Print Copy Scan, a local supplier of printers and copiers, the ride will encompass challenging off-road moorland trails set amongst the spectacular scenery of Dartmoor. Riders can choose between the intermediate 23km route or if they’re feeling brave enough, they can tackle the hills up to Princetown on the 52km route, cycling skills will definitely be put to the ultimate test. For a much more gentle route, featuring a mixture of tarmac paths and off-road trails, there is the family friendly 11km ride along Drake’s Trail, suitable for anyone with a bike. The Tour de Moor challenge departs from and finishes at Harrowbeer Airfield, near Yelverton at 8.30am. The route will go around the beautiful surroundings of Buckland Abbey, providing some tough terrain as bikers navigate their way through the woods and up some challenging hills. Registration is just £20 and includes a t shirt and finisher’s medal. Not only does the Tour de Moor get the adrenaline pumping, it also makes a real difference to patients of St Luke’s in the last months, weeks and days of life. At home, in hospital or at their specialist unit in Turnchapel, the money raised in sponsorship helps the Plymouth based charity to continue to provide specialist care to patients and give vital support to their families. Sign up for the Tour de Moor 2017 here or by calling 01752 492626.